In our previous blog post we compared the performance between Magento CE 1.9 and Magento CE 2.0. The results of the performance test indicate that Magento 2 is half as fast Magento 1. In addition, Magento 2 can be 7 times more expensive to host due to the need for additional CPU resources. We’ve received a lot of feedback from the Magento Community and are happy to see so much interest and focus on our analysis. This truly indicates how much excitement surrounds the Magento 2 project. 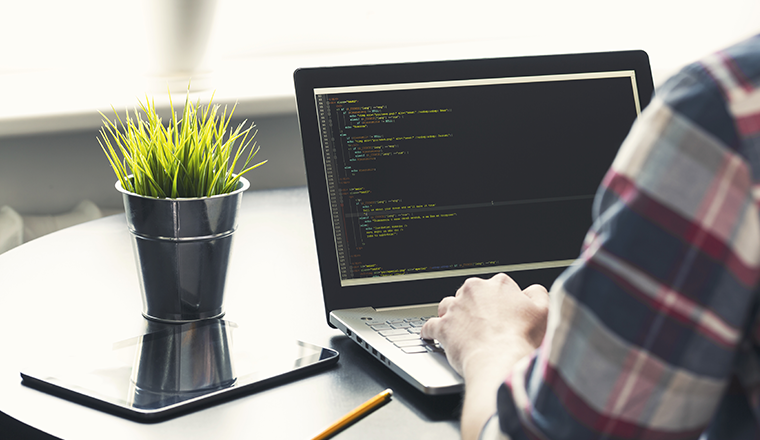 This blog post continues our series of articles about Magento 2 and concentrates on the performance analysis related to PHP 7 specifically. 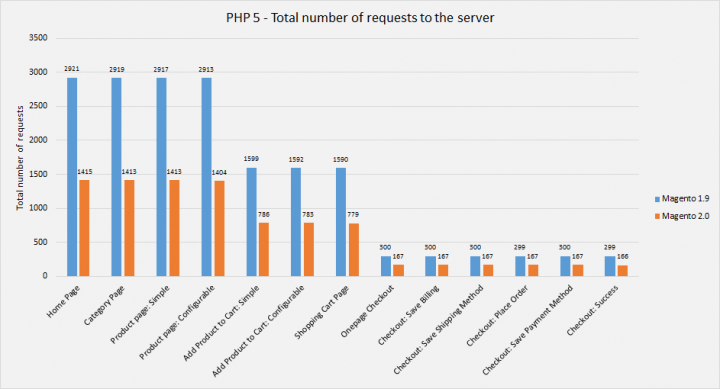 While using PHP 7, the distance between the systems was reduced allowing Magento 2 to process many more requests comparing to PHP 5 and only 24% less requests in a given load scenario comparing to Magento 1 (28,751 total number of requests for Magento 2 comparing to 37,604 total requests for Magento 1). Details of this test are shown on Graph 2. Magento 1 and Magento 2 total requests comparison when running PHP 7 below. The discrepancy between Magento 1 and Magento 2 is still significant when we look at it from a user experience perspective. As we can see in the paragraph ” M1 vs M2 server response time with PHP 7 ” , Magento 2 took twice as long to respond to a user request compared to Magento 1. It is worth mentioning that the Magento 2 project was initially based on PHP 5 but then announced PHP 7 support. During the comparison process we compared both Magento 1 and Magento 2 using PHP 5.5 version, as well as analyzing their performance on PHP 7.0.3. Before the load test, all indexes were generated/refreshed, static content was deployed, cache was cleared, code compiled, JS, and CSS minified. The test was performed on Amazon EC2 instance. We used the same software and testing methodology during our previous round of analysis with the exception of PHP version where we decided to make it variable. Magento instances were tested using PHP 5 with a goal to identify major bottlenecks making Magento 2 a slower solution. 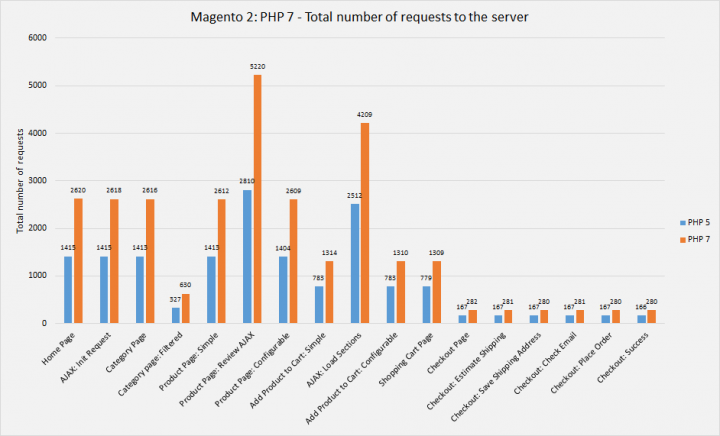 The graph shows that Magento 2 can only process half as many requests compared to Mageno 1 on PHP 5. Knowing that PHP 7 significantly improves PHP processing, we applied several patches to Magento 1 and ran the system on the latest version of PHP7. Note: Magento 1 is not officially supported with PHP 7. However, it only took us a few hours to apply publicly available community patches and additional fixes to make it work. We are planning to provide additional details on that in one of our upcoming blog articles. This graph shows that Magento 1 performed a little bit better (~16%) with PHP 7, but Magento 2 performance improved significantly, allowing it to process almost double the amount of requests that could be done by the server without a failure. Graph number 3 below compares the results of running Magento 2 on both PHP 5 and PHP 7. Server response time affects user experience, especially when a site has a large number of concurrent users. In our next comparison we find that Magento 2 fails to respond to user requests in an acceptable time much more often then Magento 1. On a product page the M1 server response time was 250 or less ms (milliseconds) in 90% of requests as shown in the graph number 4. On M2 less than 25% of requests were able to achieve the same 250 ms response time. As shown on the graph below, the majority of requests to the server resulted in a response time of 600 ms and more. The server response time differs between the systems depending on the specific page. In general, we found catalog pages took twice as long in M2 (response of 500 ms or more) for the majority of requests, while in M1 the server responds in 300 ms and less for the majority of requests. Results for Magento CE 1.9 on all tested servers are nearly identical. Under actual load Magento 1 has no visible performance bottlenecks. At the same time, results for Magento CE 2.0 are only the same between c4.8xlarge and c4.4xlarge while c4.2xlarge infrastructure is not as fast. Based on this analysis the minimum server type for Magento CE 2.0 to handle 20 concurrent requests per second is c4.4xlarge ($453.33 per month, 1 year term) while Magento CE 1.9 a c4.xlarge ($113.15 per month, 1 year term) is enough. The difference is especially noticeable on the modern system with a flexible architecture such as Magento 2. At the same time, we should still remember that Magento 2 consumes much more CPU resources when compared to Magento 1 no matter which PHP version. Magento 2 also delivers pages with a longer delay (page response time distribution) comparing to Magento 1 while under load. Based on these test results PHP 7 does help Magento 2 acheive better performance, as well as Magento 1. 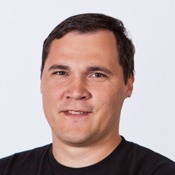 We believe Magento will address performance issues and improve the new product at some point in the future. We also hope Magento will enable PHP7 support for Magento 1 merchants as well. Did you evaluate HHVM as a platform for Magento? Very interesting article! For a new or redeveloped Magento store being built now, would you suggest M1 or M2? I’m very tempted to go down the M1 path with a store that isn’t enterprise level. It seems much faster on lower spec servers, my only dilemma is the upgrade path. I need the store to last 2-3 years before the next major re-development. Unless Magento stop releasing M1 patches or M2 becomes much much faster, I don’t really see the point. On a very low spec VPS with varnish, memcached + nginx I am getting speeds of 1.4s for Magento 1. The same server with M2 + PHP7 is 3+ seconds. However, I love the new M2 Admin. If you are doing development by yourself and official support from Magento is critical (comes only with enterprise edition), I would suggest to go with M2, hopefully performance will get better in the upcoming versions. In case if you are working with SI who will provide you support, M1 will be better option for now.